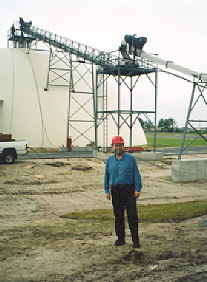 A forty year veteran of the Fertilizer Industry, CEO Mike Sackett incorporated MIKE SACKETT EQUIPMENT SYSTEMS in 1985. His company quickly establsihed an enviable reputation among the world's largest Agri-corporations as designers and manufacturers of the finest plant equipment systems available to the industry. The company's customer list includes: Agrico Canada, Ltd., Goldkist Inc./Southern States, Hydro Agri-North America, International Mineral and Chemicals Corporation, Lebanon Seaboard Corp., PCS USA Inc., Rukert Terminals, Sylvite Sales USA and Wheelabrators/Bio-gro, Inc. "We build quality relationships with our customers by being partners in their success", notes Sackett.